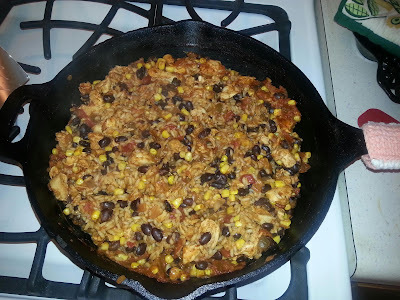 Last night, I successfully pulled off yet another recipe from Iowa Girl Eats: the Southwestern Chicken & Rice Skillet. Yet again, this is a recipe I was alerted to by the fair Tracy. This was an awesome dish because everything took place in the same pan. My dear cast iron skillet! I'm so excited about using this all of the time, it isn't even funny. Tracy recommended using an entire packet of taco seasoning, so I did. She also suggested I use more salsa and of a hotter variety. I didn't use more, but I did do half medium and half hot. The final product was nicely spicy. Boyfriend and I were both happy with it, and he likes his food a LOT spicier than I usually do. We determined that this would be awesome as a burrito filling. In fact, Boyfriend got out some taco shells and that was an excellent choice. I'm excited to eat the leftovers this weekend! I am wildly jealous of your cast iron skillet. I've been meaning to buy one for ages, but just haven't done it yet. Maybe you have just inspired me.